Featuring: Voldemort's End / Lily's Theme / Statues / Severus and Lily / Neville the Hero / A New Beginning. Composed by Alexandre Desplat (1961-). Arranged by Ralph Ford. Concert Band; Performance Music Ensemble; Single Titles. Pop Young Band. Form: Medley. Halloween; Movie; Pop. Part(s); Score. 252 pages. Duration 5:30. Alfred Music #00-38343. Published by Alfred Music (AP.38343). The epic film series draws to a dramatic close with an equally dynamic Alexandre Desplat film score. Ralph Ford has captured the imagination in his young band medley direct from the film-score compact disc. 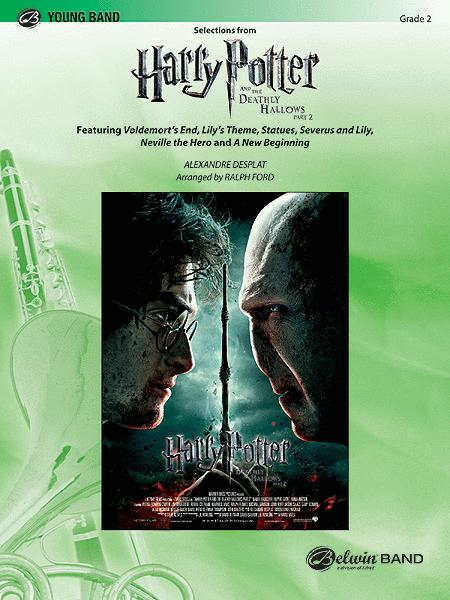 The medley includes "Voldemort's End," "Lily's Theme," "Statues," "Severus and Lily," "Neville the Hero," and "A New Beginning." Join the musical celebration with this stunning medley from the final Harry Potter film. (5:30).